2015 has been a year of upheaval here, with a house move in between the releases of The Waterborne Blade in May and Waterborne Exile in August. I’m a bit taken aback to realise I’ve been living surrounded by boxes for six months now, between permanent homes. Most recently I’ve been making notes on a new fantasy project – codenamed Fury – and work on that will begin in earnest in January. If all goes to plan I could have a first draft in place before we begin work on out next renovation project. Later in the year I’m hoping to resume work on Waterborne Revenant with a view to exploring other publishing options for it in 2017. I’ve also signed up for the first part of the new Open University Creative Writing MA. Lots of plans, but of course we all know what happens to those. Anyway, this post claims to be about the books I most enjoyed reading in 2015. Sabaa Tahir’s An Ember in the Ashes was one of my favourites, a high-stakes adventure featuring two engaging protagonists. I’m looking forward to the sequel. In House of Shattered Wings Aliette de Bodard evokes a haunting vision of a broken Paris in the aftermath of a war in heaven. Dave Hutchinson shows us more of the all too plausible future he introduced in Europe in Autumn, with the superb Europe at Midnight, managing once again to surprise the reader as the plot takes unexpected turns. I embarked with caution on Elizabeth is Missing by Emma Healey afraid the subject matter of dementia might be too close to home, but I found it compelling and immersive. Mark Alder’s Son of the Morning had me wishing I’d taken notes at times – it took me a while to sort my Edwards from my Edmunds, Mortimers from Montagus and Osberts from Orsinis – but the characters were great: Dow, who is utterly ruthless and set in his beliefs, yet plausibly so, and the Pardoner, Osbert, shamelessly out for his own gain. I was fortunate to be able to read a pre-release copy of Peter McLean’s debut urban fantasy Drake, which features a wonderfully foul-mouthed and inept summoner of demons. You’re in for a treat when it’s released next week. Sarah Pinborough’s The Death House was another page-turner that I didn’t put down until I’d finished. The outstanding read for me this year has to be The Fifth Season by N K Jemisin. This book begins with an absolute gut punch of a scene, the impact of which Jemisin manages to double up with the ending. The writing is superb, the content often harrowing and while it deals with important themes it never resorts to preachiness. I hope to see this book coming up on all the award lists in 2016. Wishing everyone all the best for 2016, and perhaps less rain as well. I’ll be out and about over the next couple of months. August: Angry Robot will be invading Forbidden Planet in Birmingham (tomorrow evening!) and London (next Thursday evening). September: On Saturday 19th I’ll be signing books at The New Hedgehog Bookshop, 19 Little Dockray, Penrith, from noon onwards. October: I’ll be at Fantasycon in Nottingham all weekend and doing a panel, pencilled in for the Sunday morning, on religion in fantasy. Do stop by to say hello if you get the chance! Super-quick blog post here. 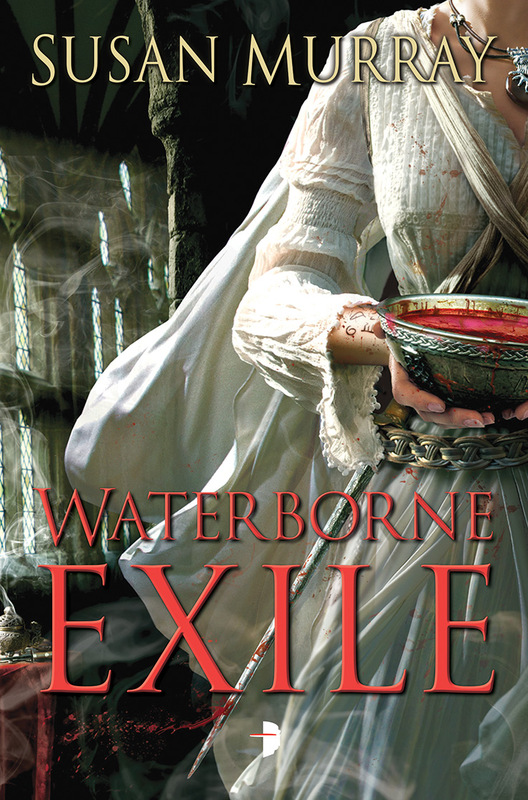 Lots going on behind the scenes and I’m deep in the first draft of the sequel – Waterborne Exile, due out August 2015 – but I had to surface to share this cover art, revealed yesterday. It’s by Paul Young at Artist Partners. It’s gorgeous. 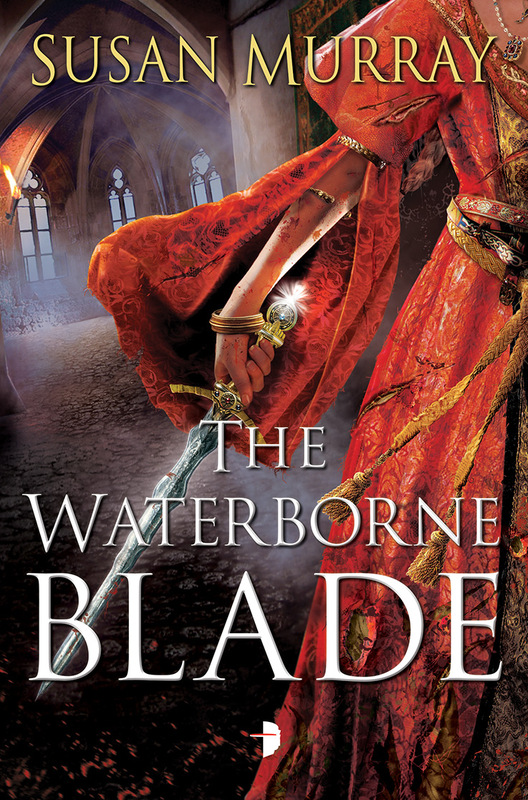 The Waterborne Blade is due for release 5 May (US and ebook), 7 May (UK). Except, of course, not much has changed after all. 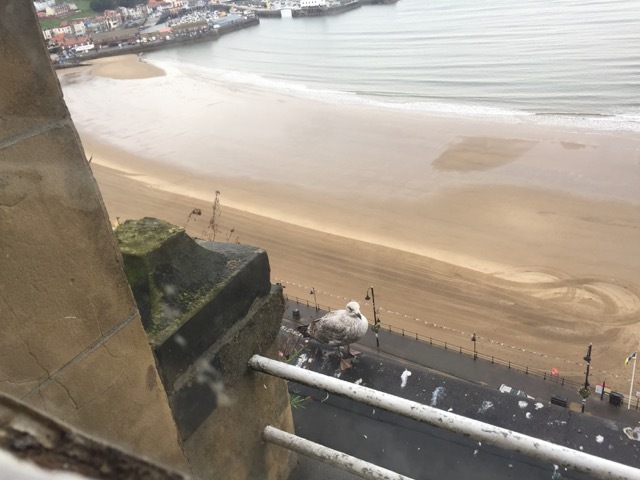 After starting with the buzz of a 2-book deal the year’s been a strange never-quite-stepping-across-that-threshold affair as my publishers were put up for sale by their holding group. They’ve risen phoenix-like from the ashes ready to resume publication in 2015 with The Waterborne Blade rescheduled for release in May. On the writing front, I’ve discovered the massive dose of validation from a publishing deal doesn’t do much to counter the self-doubt – if anything, it provides a near-inexhaustible supply of new food sources for the self-doubt. At this point I can vouch for the wisdom of advice to bash on with the next book once the previous one is out of the door. Maybe next time I’ll try that. As it is, the sequel has had the benefit of a long gestation period before drafting began in earnest in mid October. I’ve compiled a list of tweaks for the first novel to accommodate developments in the sequel and been mulling over the editor’s notes which arrived just before Christmas, ready to start work post-festivities. Drafting the sequel has been an interesting writing exercise in itself, working to get the most from the elements already in place – they say creativity thrives within constraints, after all. I’ve learned more about my writing process, too, and to trust my instincts. Since I have a grown-up author contract I set out to plot like a grown-up author. The very first scene I drafted was what I anticipated would be the final one of the novel. So far, so good. With the overall shape in mind I outlined the early stages, but the further I planned, the more hazy things became. Outlines are sterile things, and I find better details arise organically while drafting. The upshot of this is I’ve stopped trying to plan too far ahead, but now aim to work in chunks of 25-30k at a time with a pause to take stock between each chunk. On the reading front I’ve been reading more in other genres this year. Standout reads for me have been The Three by Sarah Lotz, and Europe in Autumn by Dave Hutchinson. 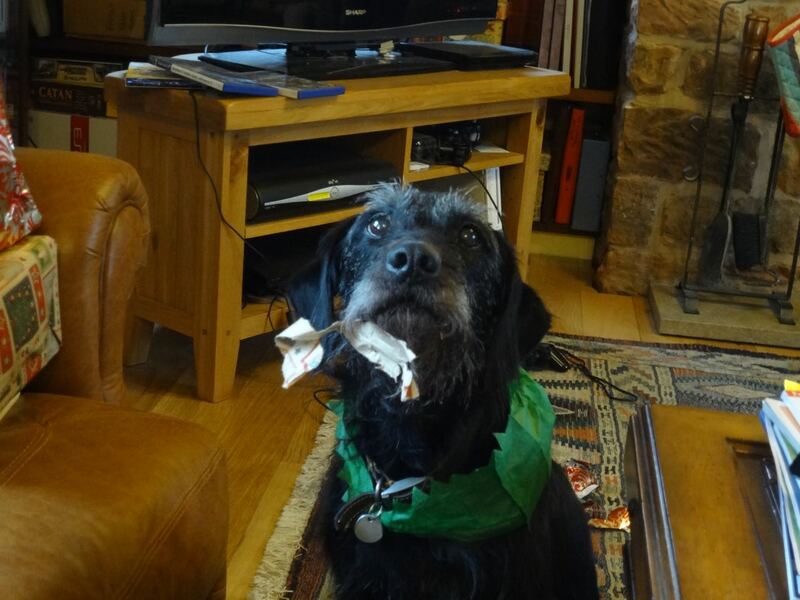 There was a load more stuff I’d thought to include here, but 2014 is almost done and there’s a lot of work ahead in 2015 so I’m closing now with a suitably festive pic of our dog (the household’s chief wrapping-shredder). 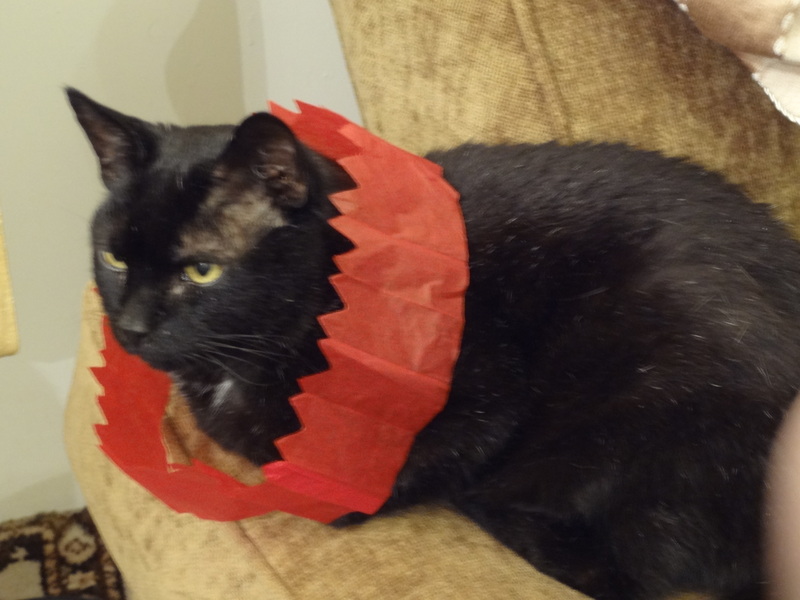 Wishing all the best to everyone for 2015, especially those for whom 2014 has been a particularly tough year.